Back when I reviewed Winter’s Eve, I teased the upcoming release of the third (and final) installment of Nox Arcana’s “Winter” series. I’m happy to report that both Jeff Endemann and the Gregorian Shadow Choir have returned for this album. Those fond of the wordless female vocals that have shown up in past Nox Arcana albums will be happy to hear how practically every song on the album uses them. 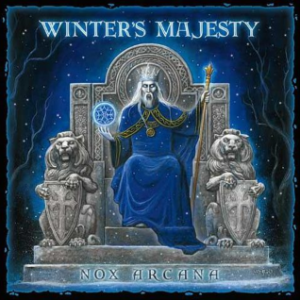 While most Nox Arcana albums have the spoken word introduction and opening song presented as two separate tracks, Winter’s Majesty bucks tradition by combining both! In “Aquilon’s Wish,” the Gregorian Shadow Choir backs the opening poem of the Winter King’s wish for peace on earth, which gives way beautiful snowflake-like chiming and piano work. It takes a somewhat darker tone later on, but is still beautiful. Interestingly enough, there’s a seemingly alternate version of the introduction performed by John Rossi available online. “Tranquility” definitely lives up to its name, with the medieval ballad-style instrumental segment and the backing strings being great touches. Personally, the music makes me think of snow quickly falling. “White Woodlands” masterfully combines piano work and chiming tones that remind the listener of snow, while “Secret Sanctuary” has an overall ballad feel. Both the wordless female vocals and tambourine add to the feel of the dark beauty of a winter’s night, while the piano ushers in a somewhat darker feel and unisex choir work. The organ and tolling bells of “Summon the Wind” give the track a Dracula-style feel, while “Snow in the Shire” has a wonderful ballad feel thanks to its use of a minstrel guitar and touches of tolling bells and a tambourine. Despite the name, the latter has no connection to the works of J.R.R. Tolkien. The word “shire” is actually a traditional English term for what would now be referred to as a “county.” “Crystal Kingdom” combines excellent soft piano work with some tolling bells while “Solstice Spirits” gives the listener as sense of falling snow thanks to its chime-like tones and piano work. “Shelter from the Cold” is much more energetic than previous tracks, although it does have a ballad-like feel to it at times. “Angels in the Snow” slows things back down in a good way. “Scarborough Fair” is a new take on classic song. Despite being commonly associated with Simon & Garfunkel, it’s actually an ancient folk ballad that has numerous alternate versions with different lyrics. For this new version, Vargo has replaced most of the lyrics (including the famous “Parsley, sage, rosemary, and thyme” refrain) so that the song now tells the tale of a spirit telling the listener to seek out his lover from when he was alive so she can visit his grave. Jeff Endemann gives an amazing vocal performance, with the opening ballad feel and tambourine work adding to overall feel. In addition to its connection to an earlier track by mentioning a shire, the online music video suggests a connection to Winter’s Knight. “Ivory Steeds” offers speedy and varied piano work with touches of bells while “Winter Haven” combines gentle snow chimes soft and piano notes with the strums of a minstrel guitar. In “Forest Lullaby,” gentle notes are joined by “chimes” to create a soothing, music box-like feel. The piano work of “Days of Olde” is noticeably different in tone than that of the past tracks. The unisex choir and snow-like chiming add to it overall feeling of long ago. “Saturnalia” refers to the festival that celebrated the winter solstice in ancient Rome. In fact, Christmas as we know it today has some of its roots in Saturnalia! The track has a definite celebratory feel thanks to its clapping hands and flutes, along with some tambourine and violin work. “The Coming of the King” uses a unisex choir backed by an organ and tolling bells to provide a sense of dark regality. Pounding drums also add to the effect. Although “Winter’s Majesty” uses soft piano work and bells, the piano is the real star here. There’s also lots of great musical variations. “We Three Kings” is an instrumental take on the Christmas classic, realized with soft piano and minstrel guitar (along with touches of bells). “Polaris” uses a different way of conveying falling snow via piano and soft vocals. “Final Peace” has a peaceful but somewhat mournful tone thanks its use of a violin and unisex vocals. Those who wait for the secret track will also hear the sounds of wind and soft piano work. As with all Nox Arcana releases, the liner notes contain the lyrics and amazing artwork (along with a hidden puzzle). In fact, some of the pages are styled not unlike the illuminated manuscript look used for the liner notes for Winter’s Knight. All in all, Winter’s Majesty offers a return to the dark feel of Winter’s Knight, while still retaining the lighter elements of Winter’s Eve. Although I’m sad to see the series end, I’m glad it got to close out with an album like this.